I don't know about you but I am loving having so many of my bloggy friends here, sharing their amazing personalities and delicious treats, and helping me out! Today is no different. Kim from Cravings of a Lunatic (and Kiss my Smoke) is superwoman. She is a wife, mother, AND she has 2 blogs! TWO! And she is seriously one of the smartest, bravest, sassiest, sweetest, and most talented ladies I have ever encountered. I cannot wait to someday meet her in person and then beg her to make me something delicious. Like this baked fudge with peanut butter cups. Or steak. 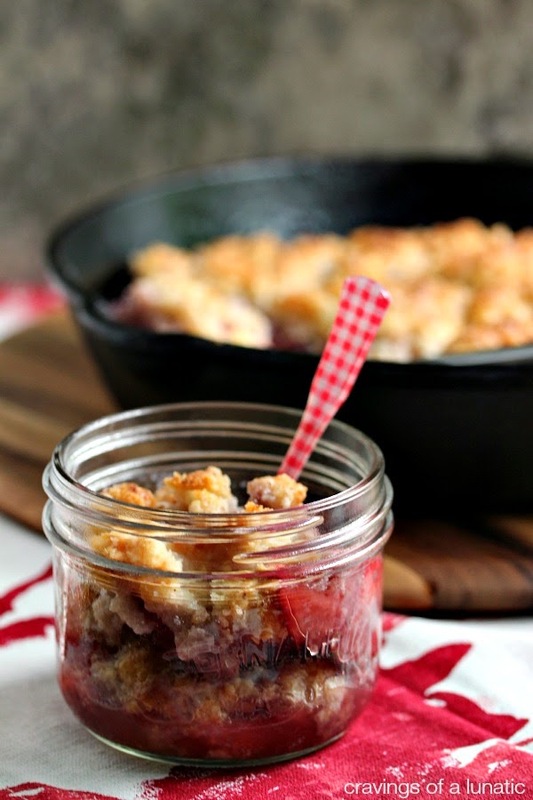 Or this strawberry cobbler she's sharing with all of us today! Hello to Kayle's fine readers. I'm so thrilled to be here guest posting for her today. When she emailed me I jumped at the chance to help her out while she's super busy moving. That's what friends are for in life. I adore Kayle, the lady is super sweet. She's incredibly thoughtful and so kind. I'm really happy to be able to call her my friend. Meeting her has been a huge perk of my job. I was going to make a turtle recipe since that tends to be what my blog is known for. Then I saw some gorgeous strawberries and knew I had to make something with them instead. One thing led to another and cobbler was on the menu. 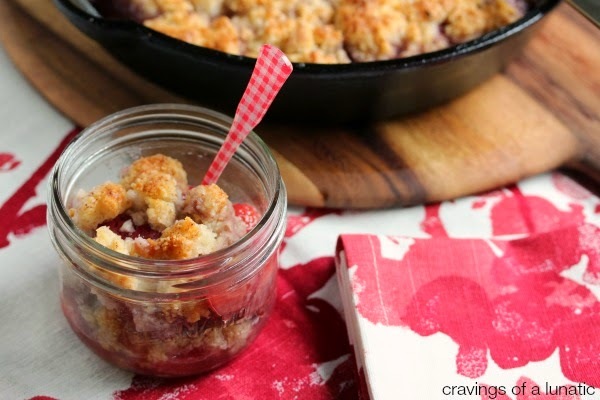 Cobbler is one of the first things I learned to make back in the day. My favourite is peach, but I love all kinds. 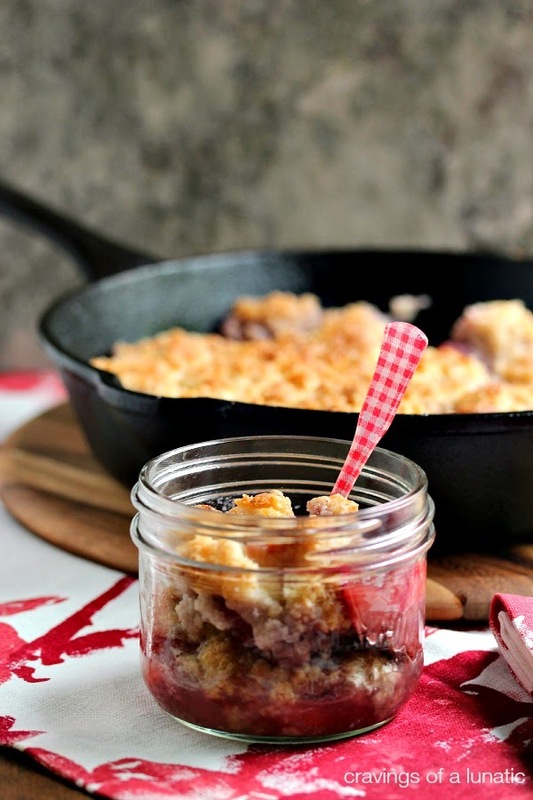 There's just something so rustic and homey about cobbler. It makes me think of summer. And let's face it, summer can't come quick enough. It's freaking cold here in Canada. I could use some warmth. Meanwhile as you're reading this I'll just be leaving Miami. I am attending a conference there for food blogging. Looking forward to a little fun in the sun with my bloggy peeps. Just wish Kayle was coming with us. She's busy doing her thing, moving and starting fresh. I am so happy for her, and proud of her. You can totally change this up and use other fruits. If you find there's too much liquid it's easy to drain off. Or if you know it's a fruit that will soften up a ton add more cornstarch or even flour. This is awesome hot out of the oven with ice cream on top. I'm all about excess. 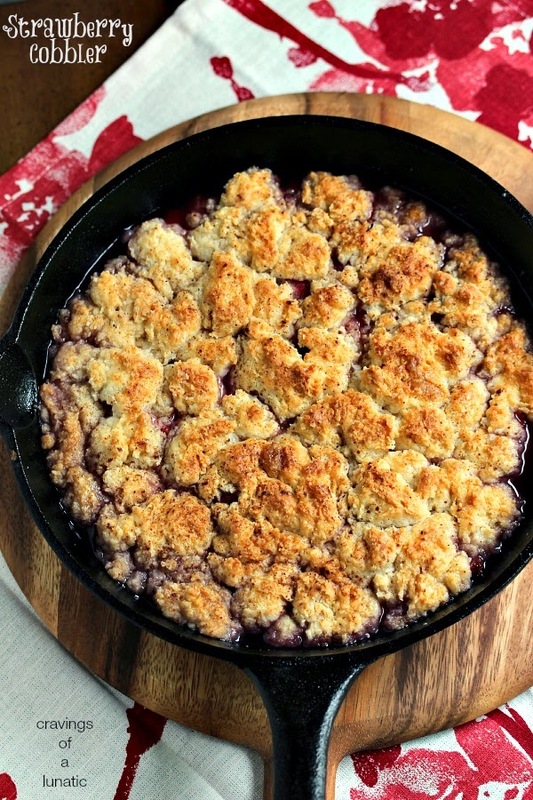 Cobbler is amazing. Cobbler with ice cream and whipped cream on top is freaking out of this world. You won't be able to stop eating it. I've been known to nosh an entire cobbler in one day. I wouldn't recommend it though, you'll get cobbler tummy. And that's never a good thing. I never learn and end up with cobbler tummy aches. It's so worth it though. Thanks to Kayle for having me today. If you have some free time buzz by my blog, Cravings of a Lunatic to check out more of my recipes. Or you can visit my grill site, Kiss My Smoke for some summer grilling inspiration. I rock the grill year round, but I know most folks are summer grill fans. Be sure to swing by and check it out. In a large saucepan combine the strawberries, sugar, brown sugar, salt and corn starch. Bring mixture to a boil while stirring occasionally. Cook for about 1 to 2 more minutes so the mixture thickens. Remove from heat. 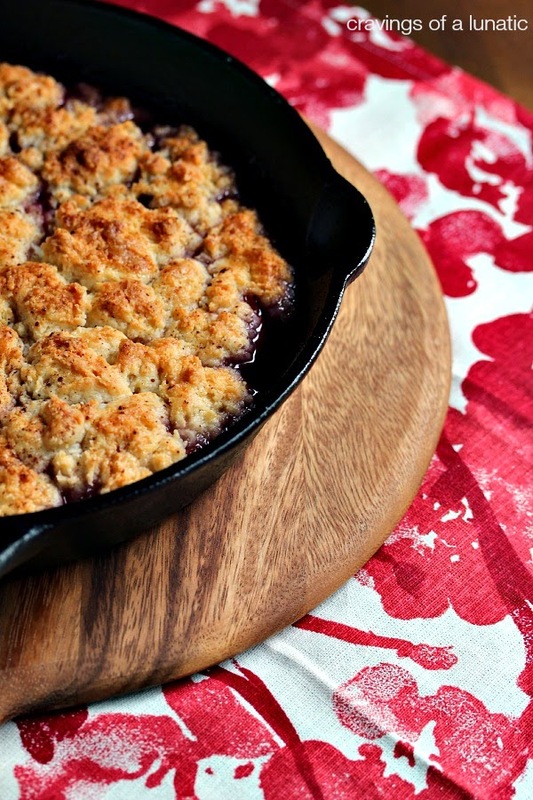 Pour into a cast iron skillet or 8 inch baking pan that’s been liberally sprayed with non-stick spray. In a medium sized bowl cut the shortening and butter into the flour. Add the brown sugar, baking powder, salt, cinnamon and nutmeg. Continue to cut the butter into the flour. It should resemble find crumbs. Now add the milk and mix until combined thoroughly. It should look like sticky dough. Drop the mixture over top of the cooked strawberry mixture. Drop in small randomly. It doesn’t have to be perfect, in fact it’s better if it’s not. You can dash some more cinnamon and nutmeg over top if you like. I always do. 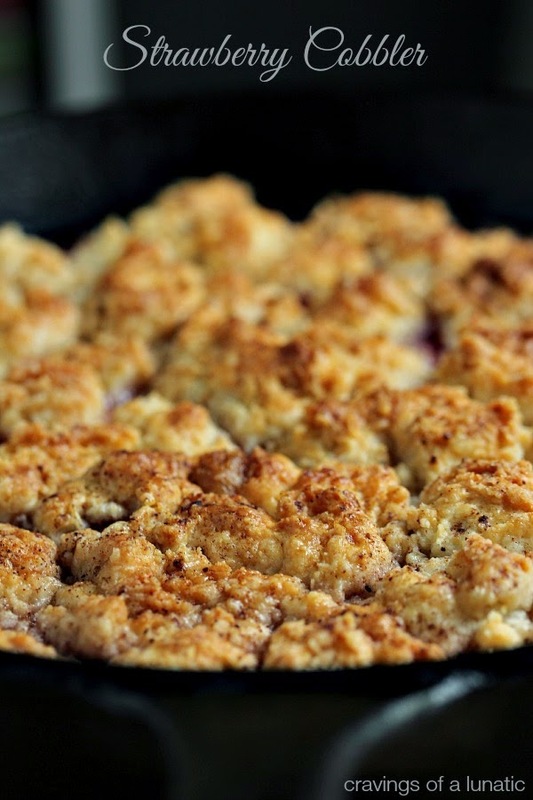 Place the skillet, or baking dish, in the oven and bake for about 25 to 30 minutes, or until golden brown. This can be served hot, room temperature or cold. You can top it with whipping cream, or ice cream. My preference is always hot, right out of the oven. Serve with a big old strawberry loving smile! (which Michael says I now must make ASAP)! To see more of Kim's awesomeness follow Cravings of a Lunatic! !